With my day's work complete, I decided to honor Earth Day with a short trash patrol on my way home. The nearest boat launch was Mortalo's Landing on the Ipswich River in Middleton and I don't think I could have asked for a better launch site. 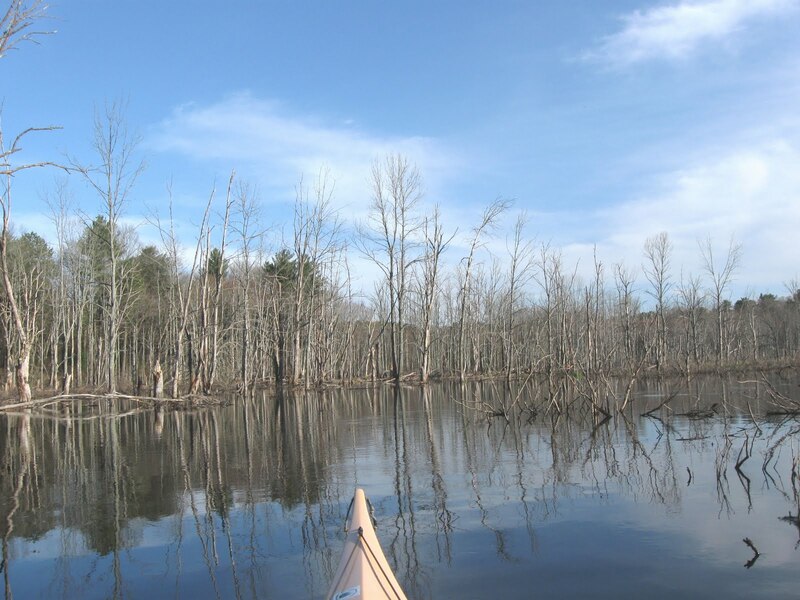 This time I headed upriver which made me a stranger in a strange land for I'd never paddled this stretch of the Ipswich River. Pushing up and over a beaver dam brought me into an area where the beavers and recent rains have created what appears to be a river of trees. Wildlife seen today were mallards, wood ducks, Canada geese, a hawk, several musquashes, and one blue heron. Somewhere in the vicinity of the West Street Canoe Launch, I stopped for a leg-stretching break before heading back downriver. 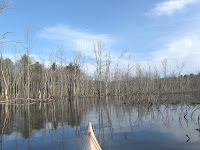 As I drifted downcurrent I encountered Bill K. and Kirk O. paddling a Wenonah racing canoe in the opposite direction. Both are members of the Cape Ann Rowing Club and seeing them, in these parts, reminded me that it's a small world. We later discussed how many plastic Hooksett wastewater disks they've seen in their recent Cape Ann paddles and wondered if the record number of Right Whales in Massachusetts Bay might end up ingesting the floating plastic disks as they feed on plankton. We hope that isn't the case. The Hooksett incident also serves to show just how interconnected waterways are when plastic disks released 40 miles up the Merrimack River can end up being found in Wellfleet on Cape Cod and on the beaches of York, Maine. 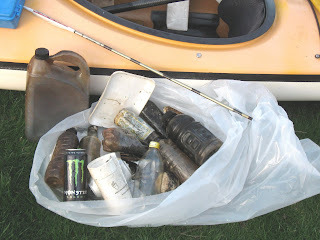 There were 10 recyclable containers (2 redeemable) and 15 pieces of miscellaneous rubbish such as styrofoam, plastic bags, a nip bottle, and an errant hunter's arrow which was stuck in a tussock. My YTD total stands at 1760.